Combine cream cheese, sugar, heavy whipping cream, eggs, and vanilla in the bowl of a food processor, pulse until smooth. Alternatively, mix cream cheese and sugar together until well blended. Add whipping cream, eggs and vanilla and mix until smooth. 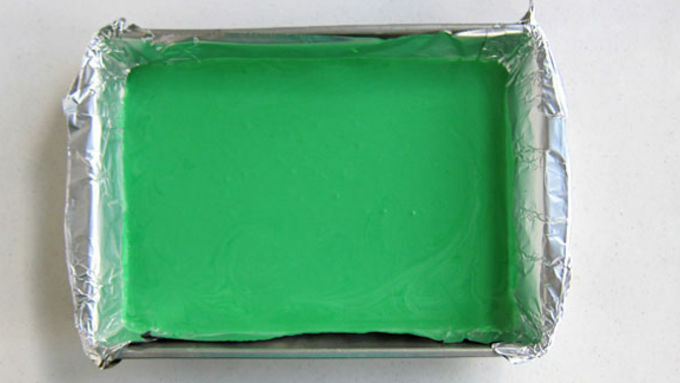 Add some green food coloring and some peppermint extract, if desired, until you get the desired shade of green. Line a 9x13 pan with non-stick aluminum foil. 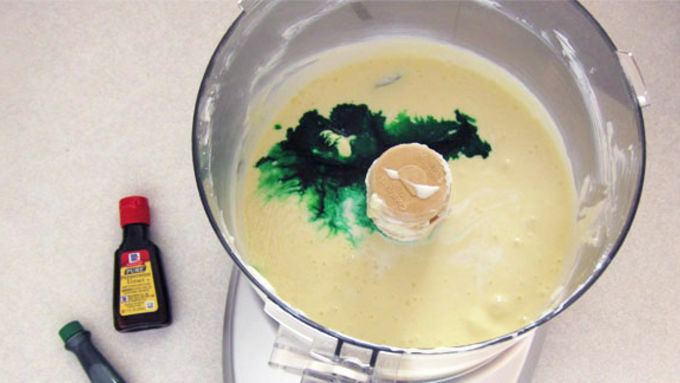 Pour cheesecake batter into the pan and bake at 325°F for 16-18 minutes. Allow cheesecake to cool for 30 minutes, then freeze for about 2 hours. Holding onto the foil, lift the cheesecake out of the pan and set it on a cutting board. 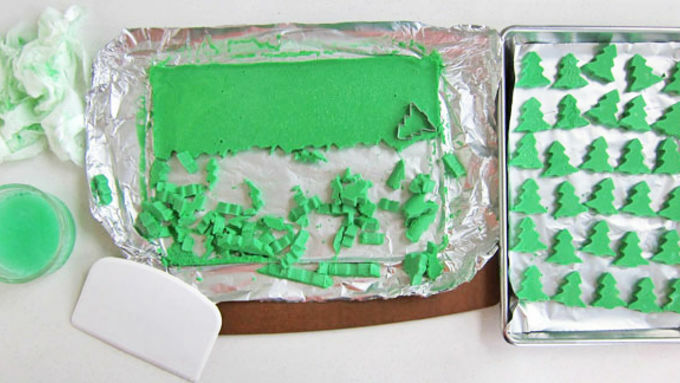 Use a small 1 inch tall Christmas tree cookie cutter to cut 48 trees out of the cheesecake. Youll need to keep the cuts very close together. Set the cheesecake trees on a tray lined with non-stick tin foil. Freeze for 20 minutes. Make cake batter according to package instructions. 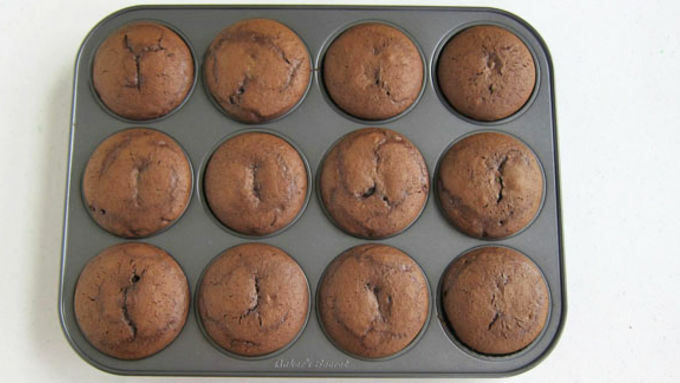 Line a cupcake pan with cupcake liners. Spoon 1 tablespoon of batter into each cupcake liner. 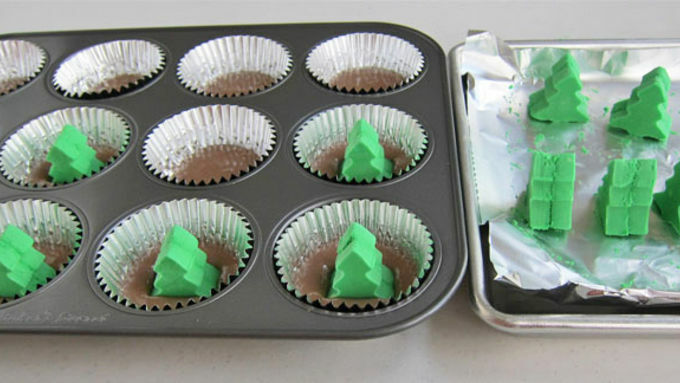 Stack two trees together, then press them down into the center of the cupcake liners. 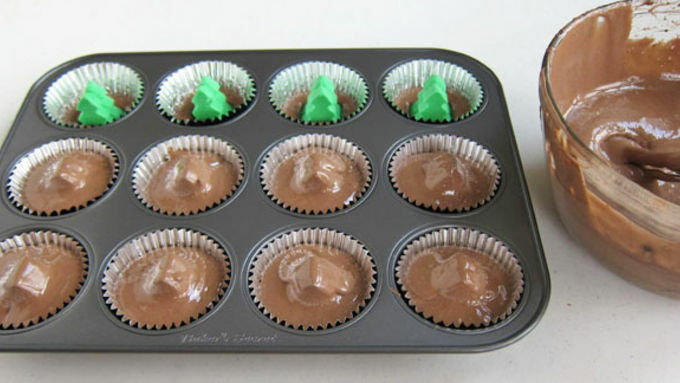 Cover the cheesecake trees with batter, equally dividing the remaining batter among the cupcakes. 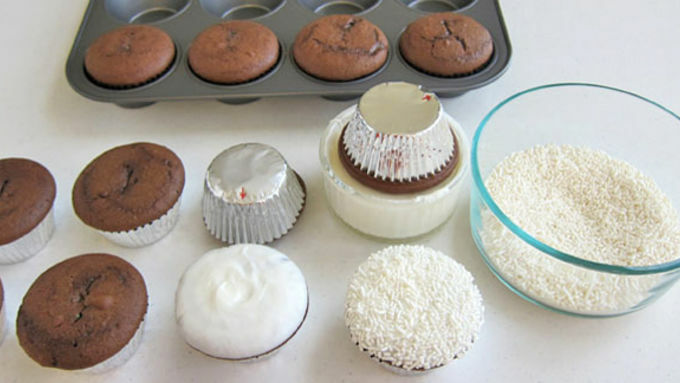 Bake at 350°F for 18-22 minutes until they look dry on top and you can touch the top of a cupcake and it springs back. Allow to cool completely. 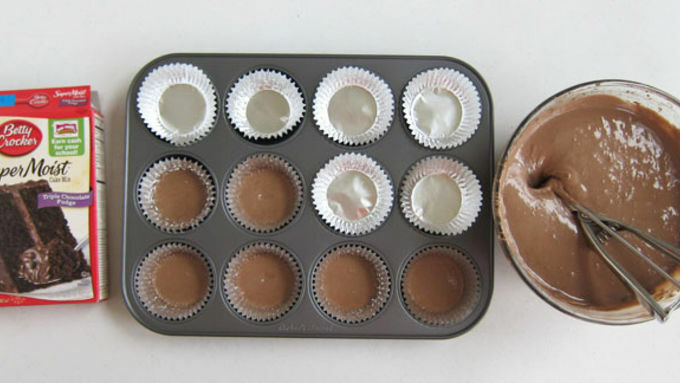 When you remove the cupcakes from the pan, draw a mark on the bottom of each cupcake liner, showing the front, so you know which direction to cut into them later. Heat 1 tub of Betty Crocker™ Vanilla Frosting in the microwave, just to melt the frosting slightly. Dip the cupcakes in the frosting then roll in white jimmies (sprinkles.) If the frosting is too thin, just allow it to cool, stirring frequently until it thickens slightly. Color two tubs of Betty Crocker™ Vanilla Frosting using Betty Crocker™ Green Gel Coloring until you get the desired shade of green. 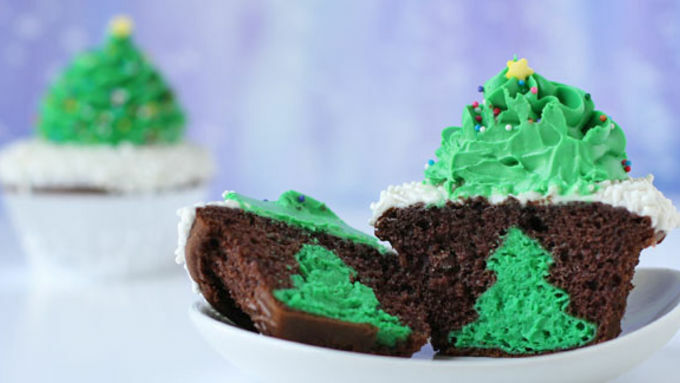 Fill a large pastry bag fitted with a large star tip with the green frosting. Pipe a tall swirl of green frosting in the center of each cupcake. Use the mark you drew on the bottom of each cupcake as a guide. Set the cupcakes facing you. Add a yellow sprinkle star on top of each tree facing forward, that way youll know which direction to cut the cupcakes to reveal the front of the cheesecake tree. Sprinkle on some colored non-pareils. Serve the cupcakes. 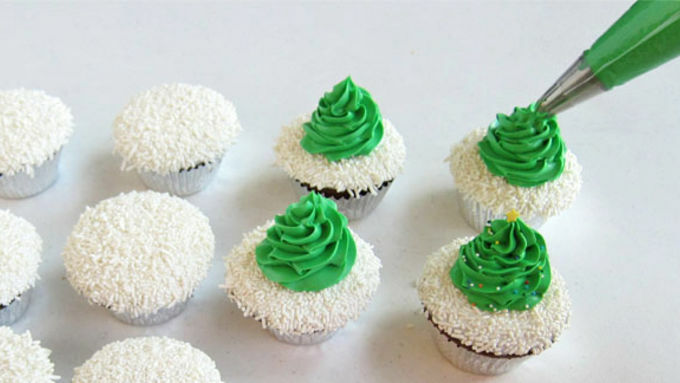 Cut across the front of each cupcake revealing the cheesecake tree. 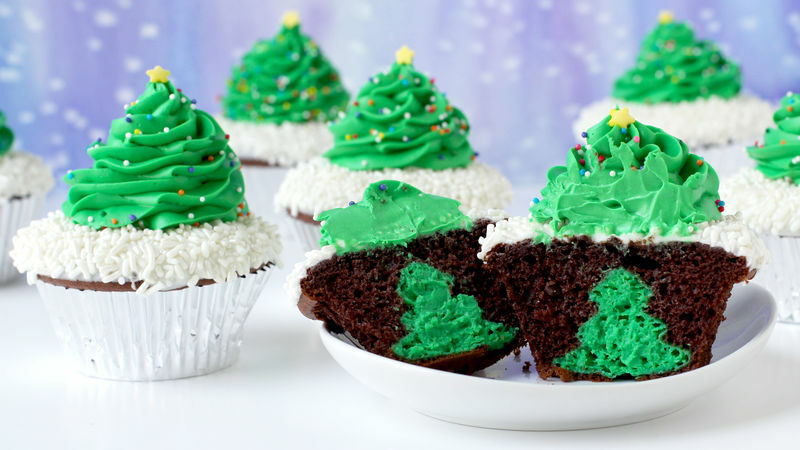 This holiday, put an extra surprise inside of these festive Cheesecake Stuffed Christmas Tree Cupcakes! Finding packages under your tree is a Christmas tradition. Finding a cheesecake tree stuffed inside a cupcake isn't – yet. It's so much fun to cut into a festively decorated cupcake to find a surprise hiding inside! Each of these Betty Crocker™ Triple Chocolate Cupcakes has a cheesecake tree baked within and is topped with a Betty Crocker™ Vanilla Frosting swirled tree. They'll look beautiful on your Christmas table, and are so decadent that both kids and adults will surely enjoy them. These cupcakes are a bit more involved than your average cupcake so allow yourself some time to make each component of this recipe. Serve the cupcakes and enjoy the smiles when you cut across the front of each cupcake to reveal the cheesecake tree!